A witness has pinned the owner of Pine Car Bond, Mr Muhammed Ssebuwufu, over the murder of businesswoman Betty Donah Katusabe in 2015. 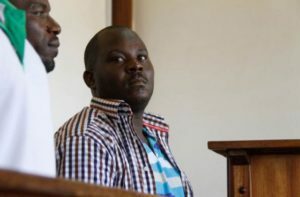 Mr Peter Tumusiime, a legal assistant at Tumwebaza, Atugonza & Kobusingye Co Advocates, said he saw Mr Ssebuwufu kicking Katusabe in her private parts and breasts on October 21, 2015. Mr Tumusiime told High Court presided over by Justice Flavia Anglin Senoga that he had been sent by his supervisor to check on Katusabe at Pine car bond. Tumusiime further told court that he found Katusabe seated on the floor with her clothes torn. She was bruised in the face and that generally she looked weak as a result of the torture. Mr Ssebuwufu and eight others are accused of killing Ms Katusabe on October 21, 2015 using sticks and pangas at his Pine Car Bond in Kampala over an outstanding Shs9m car debt. The case has been adjourned to next week on Monday.